Abstract. The summer drought of 2015 affected a large portion of continental Europe and was one of the most severe droughts in the region since summer 2003. The summer of 2015 was characterized by exceptionally high temperatures in many parts of central and eastern Europe, with daily maximum temperatures 2°C higher than the seasonal mean (1971–2000) over most of western Europe, and more than 3°C higher in the east. It was the hottest and climatologically driest summer over the 1950–2015 study period for an area stretching from the eastern Czech Republic to Ukraine. For Europe, as a whole, it is among the six hottest and driest summers since 1950. High evapotranspiration rates combined with a lack of precipitation affected soil moisture and vegetation and led to record low river flows in several major rivers, even beyond the drought-hit region. The 2015 drought developed rather rapidly over the Iberian Peninsula, France, southern Benelux and central Germany in May and reached peak intensity and spatial extent by August, affecting especially the eastern part of Europe. Over the summer period, there were four heat wave episodes, all associated with persistent blocking events. Upper-level atmospheric circulation over Europe was characterized by positive 500hPa geopotential height anomalies flanked by a large negative anomaly to the north and west (i.e., over the central North Atlantic Ocean extending to northern Fennoscandia) and another center of positive geopotential height anomalies over Greenland and northern Canada. Simultaneously, the summer sea surface temperatures (SSTs) were characterized by large negative anomalies in the central North Atlantic Ocean and large positive anomalies in the Mediterranean basin. Composite analysis shows that the western Mediterranean SST is strongly related to the occurrence of dry and hot summers over the last 66 years (especially over the eastern part of Europe). The lagged relationship between the Mediterranean SST and summer drought conditions established in this study can provide valuable skill for the prediction of drought conditions over Europe on interannual to decadal timescales. How to cite: Ionita, M., Tallaksen, L. M., Kingston, D. G., Stagge, J. H., Laaha, G., Van Lanen, H. A. J., Scholz, P., Chelcea, S. M., and Haslinger, K.: The European 2015 drought from a climatological perspective, Hydrol. Earth Syst. Sci., 21, 1397-1419, https://doi.org/10.5194/hess-21-1397-2017, 2017. 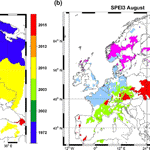 This paper analyses the European summer drought of 2015 from a climatological perspective, including its origin and spatial and temporal development, and how it compares with the 2003 event. It discusses the main contributing factors controlling the occurrence and persistence of the event: temperature and precipitation anomalies, blocking episodes and sea surface temperatures. The results represent the outcome of a collaborative initiative of members of UNESCO’s FRIEND-Water program.